Day 4. Prime Roads and Thanks Mom! The only time I ever had hypothermia was in the summer (25 years ago) and my mom rescued me. I got caught out in a terrible storm on a hot summer's day. The sky was black and it poured sheets of rain. I huddled under a tree but with my light racing kit I was soon soaked then began violently shivering. I managed to ride to a nearby town and call my mom and she got out of work and came and picked me up. Fast forward to today. 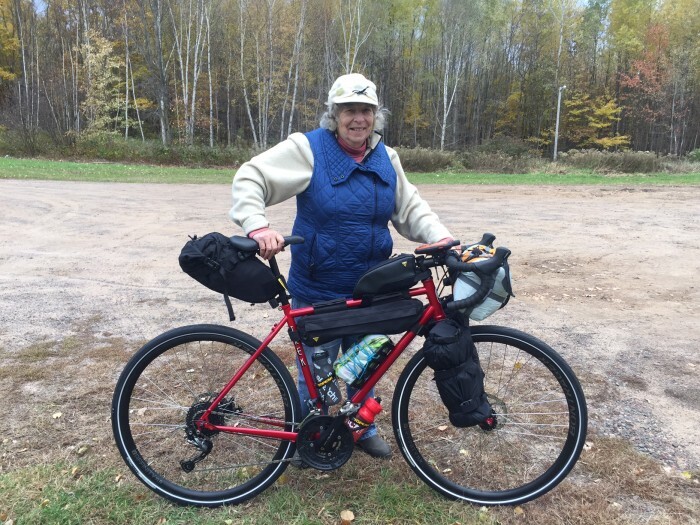 I wasn't in need of rescuing and I definitely didn't have hypothermia but my 79 year old mom drove up from the Milwaukee area to northwestern Wisconsin with my Trek bicycle so I could switch from backpacking to bicycling. I had hiked in the night prior and set up camp in a tucked away spot. At 8 am, like we arranged, my mom arrived with my bike (still in the box) and the rest of my bike packing gear. She was all smiles and we both had the same exact comment, "I've never been to this area of Wisconsin before and it's beautiful." For the next two hours, my mom hung out while I pumped up tires, attached Topeak bike packing bags and cages, and generally sorted gear. I also stowed a few odds and ends that I would need for kayaking in three days time. Finally, it was time to say good bye and start riding. It took a few minutes to get into a rhythm. I had to stop a few times and make adjustments. After all, this was a new Trek 520 and I had only enough time to take it for a short spin (100 yards) on my road in Crested Butte. But despite its newness, it's still a bike and I love bikes (almost as much as snow). And it's a really comfortable bike! Soon, I was rolling along - slow and steady. I knew it was going to be a long day but I wanted to keep an easy spin. With the added weight of all my camping gear, going uphill was noticeably more difficult. Luckily, a stiff wind was blowing from the Northwest and gave a significant boost throughout the day. I have to say this was easily one of the best days of riding in my life. I road through one small town after another. In between, I rolled on county highways and farm roads with almost no traffic. Farmers were out in the fields with combines cutting wide swaths of corn. In one newly cut field, a flock of Sandhill Cranes were picking at the remains as an immature bald eagle flew over and harassed them. I saw three eagles today, in fact. One of my friends from My hometown - who ironically also now lives in Colorado - was thinking about joining me on the bike leg of the WisconsATHON, but he couldn't get his schedule changed. I thought about texting him just to give him a heads up on what he was missing, but I didn't. Today was exactly what these stateATHONS are all about - finding adventure in your own backyard. Two days ago, I was hiking on a trail so covered with newly fallen maple leaves that I almost got lost several times. Today, world class bicycling. Welcome to Wisconsin ladies and gentlemen. I managed to find a small county park just outside of Wisconsin Rapids (that shall remain unnamed) that made a perfect stopping point (and camp) for the night. Image: My mom, Judy Larsen and my bike!